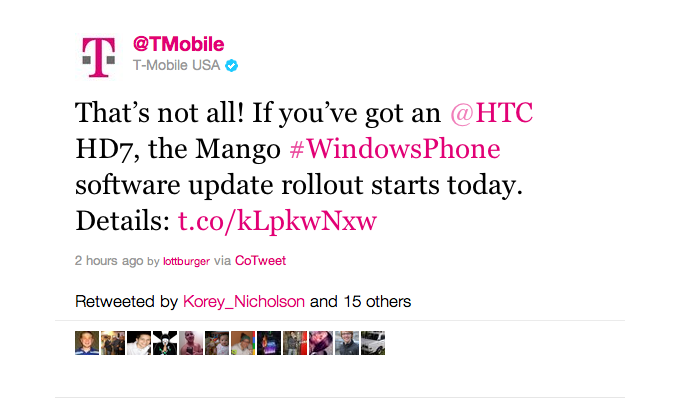 So that Mango update we said was currently “scheduled” for T-Mobile Windows Phone 7 devices earlier in the day? Well it’s actually scheduled to begin today and not within the next 10 days as we thought could be a worst case scenario. 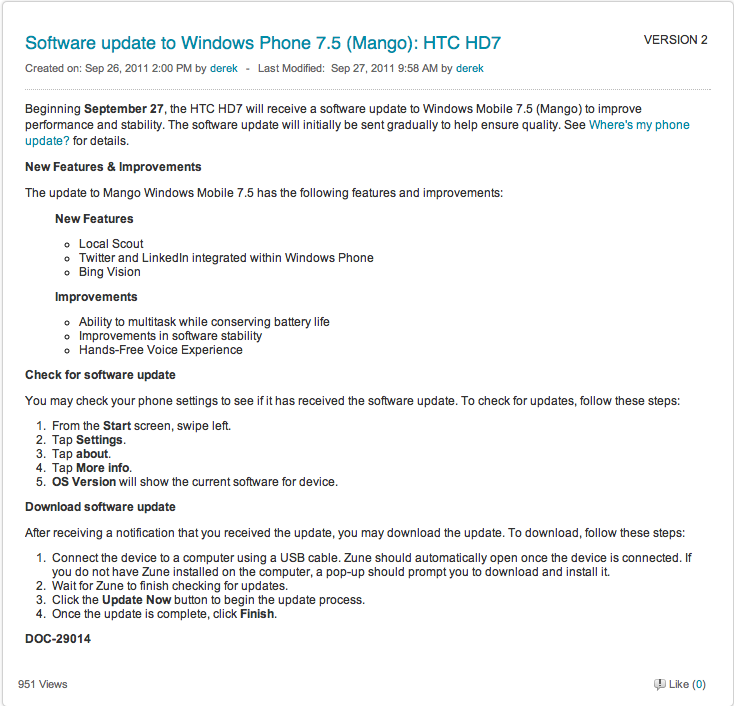 HTC HD7 owners should be on the lookout for the Mango software update beginning today. As discussed in this mornings post the update will initially be sent to a small group to help ensure quality with a broad update happening shortly after. Check out the full list of details and download instructions below! Will updating to mango delete all data on the phone? I’ll find out when my device finishes updating soon (been an hour right now). But I doubt I’m going to lose any data. Bleh…had to force the update using the trick posted on other sites but at least it’s updating as I speak. Wow that’s cool that you can force update a Windows mobile and it actually work. One day I hope we can do that with Android. Yes, I tried that useless update code on my MT4G a long time ago. Perhaps you will never get taht update. Android devices and update situation for them is total mess and totally up in the air depends on manufacture, model, carrier and etc. Go try Windows Phone devices and I am sure you will love it. Time to upgrade to better and faster smoother OS that actually has a real support behind it. My HD7 update just finished! Received notification today and updating, did not need to force it. Just finished with mine and everything is preseverved just like the nodo update. I was actually on the 7712 beta and it went smoothly to 7720 without having to rollback to nodo like said earlier. thanks Microsoft for taking care of that because I just wasnt ready to loose my sms and setting for the mango beta. Now I can wait for the next wp7 phone because the Radar is not for me! How’s the Turn by Turn navigation? As good as Google Maps? Better than Google Map for sure. I had a chance to play with hd7 running mango so buttery smooth. I like my cliq2 and android but microsoft has a winner with thier soft ware. Even my bud who is die hard apple, iphone 3g, iphone4,ipad2 and macbook broke down and admitted it was sweet. The forced update does work: http://www.wpcentral.com/force-mango-update-early-through-zune-software I just updated it went quick and easy (20min install). <3 it! indeed it does bro. i found it to go smooth as butter when i connected the usb cable to a usb 2.0 or 3.0 port instead of 1.0. I got mango, although I had to force it. i had forced build 7712 on my hd7 do i have to revert back to nodo to update or will it still bring up the update notification??? You shouldn’t have to roll back. I didn’t get an update notification on my phone, but when pluging into Zune it started the process. You had the RTM on your phone and went straight to carrier version of Mango??? I was dreading losing app data by having to restore phone to Nodo. I know I didn’t have roll back. Have to give Microsoft props for even updating my “hacked” phone. whats different from 7712 to 7720.68?? Worked like a charm on my T-Mo HD7, thanks for posting this! No you are just a troll that came here to lie and trash Windows Phone. Go back to your holw and play with you buggy slow outdated Evo 3D. No one need your uselss lies and comments here. You are just a tool and you never owned Windows Phone device. Well, I own an HD 7 and I agree with the guy. Android is superior. Microsoft should adopt a new tag line “Windows Phone 7- Because you are too stupid to use a phone” It’s fast, for sure, but it looks like Sesame Street, there are not too many apps, and everything costs money. My HTC Sensation or any of the recent android phones can run circles around this, and not look like a preschool operating system while doing it. go back to your ugly Android! I just forced updated my Dell Venue Pro last night, i am loving Mango i am just really sad they STILL haven’t fixed the E-Mail forwarding bug. Man… same thing here!!! How could they miss this??? HOTMAIL acct & WP7 (both Microsoft), this is embarasing!!! Also… we are still not able to SEARCH/FIND text/sms messages??? Realy? How can I find a text in 500 conversations? Email app has this but not the texts. Also I still can not REJECT a call with a text message. I know it sounds like a lot of demands, but all the previous versions had this (and ALL the competitor s / OS’s) . I had this in WM5 – 6.5. I am thinking to sell my D V pro… I waited enough for basic functions. Hopefully they update those things soon. My only other complaint is battery life. Though I am running WP7 on my HD2, so maybe thats why. How is everyone else battery life? will we be able to download ringtones now? Yes you can download, upload or creat your own ringtones. Can anyone tell me what the exact os version is on their phone after updating? Go to Settings, About, More Info, OS Version: 7.10.7720.68 is where I’m at, which is the RTM release. Just wondering if I should update my HD2 from RTM. Thanks! The version number is the same, but there is also a firmware update for the HD7. Since you say you have the HD2 I guess you don’t need to worry about it. i got the same problem…..
I’m also not able to get mango update …. Any other way to update it. how to do force update?? So if the update hasn’t come down, would it be better to keep waiting or just force it? How to force the update, It actually works! hey im frm sri lanka..when would u think we will receive da update..?? any ideas? ?